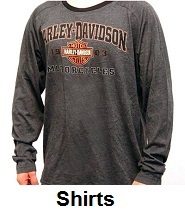 Huge sale on all biker shirts and t-shirts, save on mens and womens biker shirts and t-shirts when you shop at Motorcycle Gear Superstore. We ship worldwide, shipping charges for non U.S. rates will be applied at check out. Shipping charges will be set at the lowest price option available. 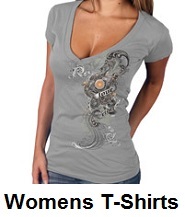 Men's and women's biker t-shirts are available in many styles. we offer top quality shirts and t-shirts for men and women riders. our biker t-shirts are made of durable fabric and will last for years. 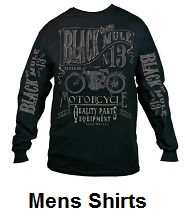 When it comes to biker t-shirts or biker shirts motorcycle riding, we have the largest selection of men's and women's biker t-shirts. 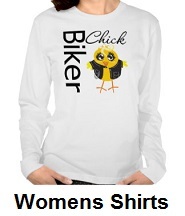 Men and women will be able to find biker t-shirts for motorcycle riding at discount prices and enjoy the savings we offer on all our biker shirts and biker t-shirts. How to select the right biker t-shirt. Most bikers to wear t-shirts while riding motorcycles, because it will keep them cool on a hot summer day. Other bikers will choose to wear a long sleeve shirt on cooler days or to keep from getting sun burnt. 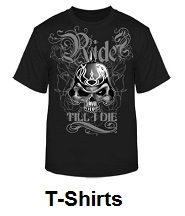 The best advice is to choose a biker shirt or biker t-shirt that is right for the riding conditions. Some bikers will select t-shirts, because of a certain motorcycle club they belong to. Other bikers will buy t-shirts to show support for our troops or for patriotic reasons. some will shop for t-shirts because it shows their funny or wild size. we offer club t-shirts, patriotic t-shirts and t-shirts with jokes on them. All our motorcycle biker t-shirts, come with a 30 day unconditional return policy. Just return any motorcycle t-shirt, within 30 days and we will grant a full refund. 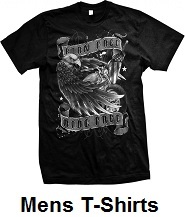 Thank you for shopping with us, we appreciate your purchase of any biker t-shirts.